This new title provides a systematic review of complex cases in peripheral vascular interventions (PVI), a minimal invasive endovascular approach to treating peripheral arteries. This increasingly evolving area in interventional therapies offers reduced risk for complications compared to conventional surgery and takes advantage of advanced techniques to treat more complex lesions in severely diseased patients. A summary of the key issues for the successful and safe treatment of complex lesions in this vessel area. 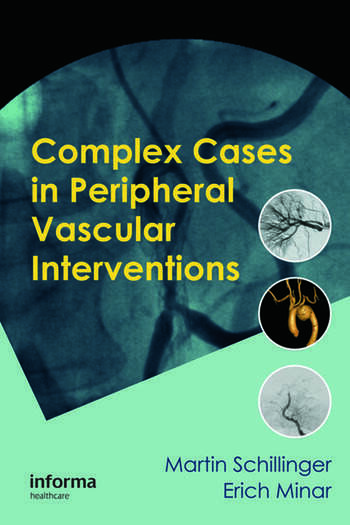 Complex Cases in Peripheral Vascular Interventions offers readers the opportunity to tap into the knowledge of those working on complex cases in this cutting edge field and receive both theoretical information and practical tips on how to approach specific vascular lesions. This book is a highly recommended read for beginners in endovascular interventions who want to get an impression on the advanced scope of treatment options as well as for experienced interventionists who want to extend their knowledge on difficult cases. Why Should We Tackle Complex Lesions by Endovascular Techniques? Martin Schillinger, MD is a Professor and Senior Physician at the Department of Internal Medicine at General Hospital Vienna, Austria. Dr Schillinger gained his Medical Degree with honours in 1998 from the University of Vienna and in 2002 was appointed Associate Professor at the University. He runs a private practice clinic in Vienna and has held his position at General Hospital Vienna where he also specialises in cardiology and angiology. Dr Schillinger has been lead investigator of numerous clinical trials and collaborated on many muliti-center trials. He is on the advisory board of Boston Scientific, Abbott Vascular and Amaranth, among others, and editorial board of numerous societies and journals. Dr Schillinger has published and presented his work extensively. Erich Minar, MD is a Professor of Internal Medicine at the MedicalUniversity of Vienna. He graduated from the Medical School at the University of Vienna in 1977 and following a position as an assistant in Internal Medicine at the University Clinic Vienna, was appointed as Assistant Professor at the Department of Angiology in 1984, and Professor of Internal Medicine in 1993. Since 1998 he has served as Deputy Head of the Department of Angiology at the University. Professor Minar has published more than 350 papers in peer-reviewed journals. He is co-editor of the European Journal of Vascular Diseases and editor of several books, including Complications in Peripheral Vascular Interventions (2007).